Tonight Sarah and I watched the new documentary called “The Cove”, about the dolphin industry in Taiji, Japan. The economy in Taiji is based on selling dolphins to places like Sea World and other dolphinariums. All over the world there is a huge market for dancing, swimming and ball catching dolphins. Fishermen in Taiji provide dolphins for this market by trapping them and allowing buyers to take their pick. A line of fishing boats use hammers to bang on empty pipes that have been lowered into the water. This creates a sound barrier that herds scared dolphins into a tiny cove. The fishermen block off the cove with giant nets trapping the dolphins. But what happens to all those dolphins that aren’t selected to be Sea World’s next star? 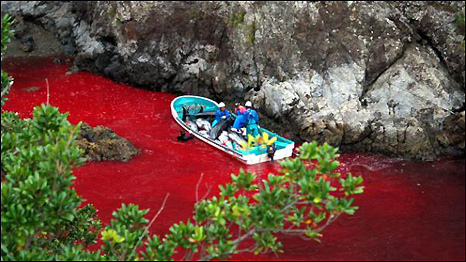 They herd the remaining dolphins into a second, unseen, inaccessible cove, and harpoon them to death. The meat from this slaughter is supplied to schools to be put into childrens’ lunch programs, sold falsely as whale meat in grocery stores, and who knows what else. And to top it all off, mercury levels in dolphin meat can be up to 20 times higher than the amount accepted by the World Health Organization. Whaling was banned by the International Whaling Commission in the 1980s, however the IWC does not specifically state attempt to deal with small cetacea. Member governments hold different views over the legal competence of the IWC to regulate direct and incidental catches of small cetaceans. However, they are working to promote cooperation between the coastal and range states to conserve and manage these species also. Although the Commission does not set regulations for small cetacean management, the IWC Scientific Committee addresses matters of the conservation of small cetacean species at its annual meetings.(http://www.iwcoffice.org/conservation/cetacea.htm). Contact the IWC and tell them that dolphins are cetacea too. ← Silent Auction Fundraiser a Success! On the subject of whaling… The Japanese Government states that they are required by the IWC to sell whale meat as food since the animal has already been killed. On that front I do not necessarily object – but the mammals should not have been killed to begin with. The Government defends the sales of the whale meat in saying that there is no profit to the government, and that the funds go – back, mind you – to the non-profit scientific research programs that kill the whales in the first place. Excuse me? Did I just hear you say that everything’s ok, because the blood money is made goes back to the blood money-making groups? What kind of sick, cyclical reasoning is this? Maybe I am a little too quick to judge. The fact is that the “research” institutes are not transparent and the actual scientific research conducted is not available to the public. The value of their research is therefore questionable. In 1976 Japan issued itself a permit to kill whales for scientific research under a provision made by the IWC, and did so again in 1986. This habit of issuing itself permits under IWC regulations is the very essence of finding loopholes. All this, of course, happened after the Japanese halted commercial whaling under IWC regulations and international pressure. Even then, the Japanese voted against the 10-year moratorium on commercial whaling. In fact Japan voted against the moratorium all four times that it was proposed between 1972 and 1982. So are we to believe that after all this, the Japanese suddenly discover the benefits of scientific research, while simultaneously giving up whaling? The lethal methods also raise an eyebrow. Yes in many areas of scientific research there is killing involved. But they have been relatively transparent processes – or in the very least, they have yielded publicly available results – and in some cases, very important, life-changing ones. Drosophila melanogaster, also known as fruit flies, have produced valuable research results in areas of study such as genetic disorders and genetic risk factors, such as autism. (If this sounds familiar, this topic recently made public headlines by the idiocy of one Sarah Palin in her comments on “projects that have little or nothing to do with the public good”). The scientific research that Japan is conducting needs to be transparent in order to justify whaling. Until then, it remains junk, pseudo-science. The Government’s official position on this subject can be read here, fortunately in plain english and not muddled in political mumbo-jumbo. I’m glad that I watched this film soon after I watched “Food, Inc.” because they have some issues in common. I believe that the main reason for all global problems nowadays is that the world is human-overpopulated. Because of it our demand for food (and energy) is just too large, and overpopulation is an issue we must deal with (after we have dealt with more urgent climate change). Unfortunately I don’t know how to do it, because it is against or natural instinct to multiply as a species. I am not sure if whales and dolphins affect the yield of commercial fishing much, but, if it does, as Japan asserts, then this is the problem: the demand for fish is just too high (because there are too many people) and we, humans, have to compete with other fish eaters. I agree that what Japanese are doing most likely is not research. But there is a way how to stop them from lying: allow commercial whaling in small scale. While eating dolphins might not be their tradition, eating whales is, and we should pay at least some respect to it. I’m wondering if there is strong evidence which contradicts Japan’s “this level of sampling does not pose any risk to the current status of whale stocks”. Indeed, if these whale species are not endangered anymore, why can’t they hunt them? However, this would still won’t satisfy their whale meat demand, and they would try to find ways around it. Also this would not solve the problem of dolphin hunting, and strict restrictions have to be made anyways.